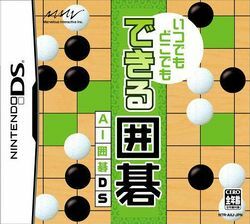 いつでもどこでもできる囲碁: AI囲碁DS (Itsu Demo Doko Demo Dekiru Igo: AI Igo DS, roughly Play Igo Anytime, Anywhere: AI Igo DS) is a Nintendo DS game for playing and studying the game of go. Due to the very complex nature of go, only the basics will be explained in this guide. This guide will, of course, also cover the software itself. Itsu Demo Doko Demo Dekiru Igo: AI Igo DS uses a version of The Many Faces of Go, a popular go-playing engine and PC program, and can play at about the strength of a low-level amateur. While not strong enough to sufficiently challenge even mid-level players, beginners (as well as those who wish to take go with them everywhere) can find plenty to do here. AI Igo DS features the ability to play against the computer, play two-player matches over local wireless, record games, and study the fundamentals of go. Though this guide includes Japanese text, knowledge of the Japanese language is not required. The Japanese text used in this guide primarily serves to illustrate what is found within the game. By placing the text as it appears in the game next to an English translation or explanation, this guide attempts to make navigating and understanding the game easier for non-Japanese speakers. This page was last edited on 10 July 2016, at 03:23.